Twelve of Bristol’s most talented guitarists and musicians came together to perform and record the Trinity Anthem to raise funds for essential repairs to the iconic Trinity towers, windows, roof and stonework. The performance and recording of the Anthem took place on Tuesday 4th April in the Main Hall at Trinity, and took a day to produce. The Anthem was the culmination of dedicated support by Adrian Utley and John Parish, who created the piece of music to support Trinity’s Notes for Notes Appeal. 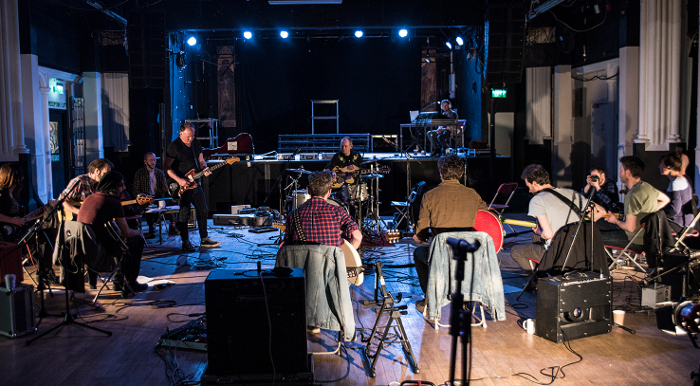 This was the first time Adrian and John collaborated on a musical project, although they performed together at Trinity in 2014 as part of Adrian Utley’s Guitar Orchestra. Portishead member and Bristol-Sound pioneer Adrian Utley was joined by world-class composer, musician and producer John Parish, who wrote and produced the Anthem. They were also joined by Stig Manley, Hazel Winter, Alex Vann, Alex Lee, Alex Hogg, Ben Shillabeer, Deej Dhariwal, Charlie Romijn, Jim Barr and Tim Allen. The track is available to download for donation through the Bristol-based music-share website I Give You Give to support the repairs to the Trinity Centre. The Anthem can be downloaded for a donation of £1, but every penny raised will fund the essential repairs to the Trinity Centre. The Trinity Centre hopes that people who hold the venue close to their hearts will support the charity by downloading the Anthem and spreading the word.